Split (1998) included in the Pulse of Color at the Kemper Museum of Contemporary Art, Kansas City, MO. Spreading out from the galleries walls as if seeping from underneath the Museum’s infrastructure, Polly Apfelbaum’s Split (1998) pulses with color. 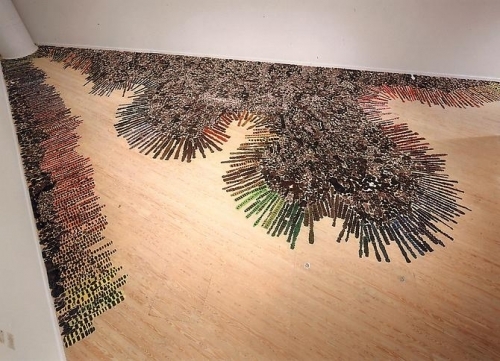 The sculptural installation’s two—almost touching—forms spread like trickling paint across the floor. The forms and fabric blotted with color remind us of the stained canvases of such Color Field artists as Morris Louis, Dan Christensen, Helen Frankenthaler, and Kenneth Noland, featured alongside Apfelbaum’s work in this exhibition. Apfelbaum’s Split is a sprinkling of organic shapes of crushed velvet pieces that call to mind stone-like forms or botanical tendrils of color. The amoeba-like form undulates throughout the gallery following the architecture, while the colors fan out across the room like the changing colors of a sunset over time. Together, Noland’s Mysteries: Red Light (1999) and Apfelbaum’s Split demonstrate a dialogue of concentric compositions and attention to color dissolving the differences in media represented.